Jai Mahakali. "Aayo Gurkhali" the battle cry of the Gurkhas meaning "Gurkhas are upon you". This war cary bellowed at the top of their lungs as they ran into battle, would strike fear into the souls of the enemy who heard it, such was the Gurkhas fame as the most fearsome of any warrior. With their legendary Khukuris in hand, these brave men from the hill top tribes of Nepal had been through the toughest of selections to become Soldiers of British Army. Adapting to wherever they were sent to fight, these men have proven themselves in any fight, from the Jungles of Burma, Europe, even the Falklands, the fearsome of Gurkhas have served Britain for over 200 years and with all this in mind, Khukuri House have redesigned this Khukuri to Honor these brave little men/soldiers nick named "Johnny Gurkhas" with this WW2 Khukuri. The only slight change this house did was to change the Cho/Kaudi to shape into the letter G which is the 1st of its kind to represent the word "Gurkha". 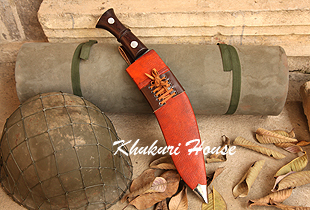 This House is proud to pull off this wonderful Khukuri blade that made history back then and the remake of this khukuri not only reminds us of our victory but brings all the Johnny Gurkhas alive from that era. Long live all Johnnys.